On December 26, 2004, a series of horrifically destructive tsunamis struck many land masses touched by the Indian Ocean. Over 230,000 people were estimated to have died and nearly 1.7 million people were displaced during the events. THE IMPOSSIBLE, the first film from director, Juan Antonio Bayona, since his breakout, THE ORPHANAGE, and incidentally also his first in English, tells just one of those stories and, in doing so, provides one of the most emotional experiences I’ve had at the movies in quite some time. Ewan McGregor and Naomi Watts play Henry and Maria, father and mother to three young boys, all under the age of 12, on vacation in Thailand for the Christmas holiday. Dad is in the pool with the two youngest when the torrential tide starts to come in, while Mom is a few feet away with a book, and their eldest, a few feet further away getting a ball. Up until this point, Bayona has allowed us to spend a few moments with the family, to get to know them, even if just a little, so there is actually some connection to them that binds them to us when they are fighting for their lives. Then, he simply lets the natural horror unfold and before long we are immersed in devastation and desperation, and led towards salvation by two strong performances by McGregor and Watts. 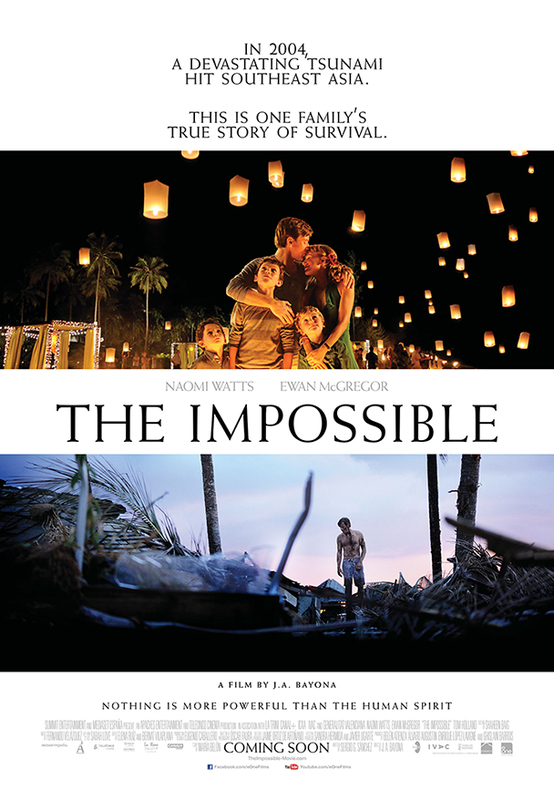 THE IMPOSSIBLE is quite an apt title for this film. Not only is the experience this family endures an impossible one to survive, but making this film is in itself an incredible feat that should not have been possible either. With the Indonesian Tsunami not quite 8 year behind us now, this disaster movie could have literally been a disaster if it got anywhere near exploiting the events for the sole purpose of titillating the audience and manipulating our emotions. Bayona flirts with this fine line on occasion but for the most part, he creates an honest space that just allows this powerful story to be told and resonate with the sheer nature of its authenticity. I can understand why people stayed away from THE IMPOSSIBLE in theatres. Watching a natural disaster unfold on film is not the way everyone likes to spend their cinema dollars. I actually saw it twice in theatres but I’m a masochist that way. All the same, if you haven’t already seen this film, you are seriously missing out. Yes, it takes you to difficult and scary places but the rewards from going there are so great that it makes the arduous journey well worth any tears you shed. And shed them you will. In fact, just in watching the special features on the Blu-ray, I almost shed a few more myself. THE IMPOSSIBLE received some criticism when it was released suggesting that telling this one particular family’s story in fact takes away from the overall devastation that impacted hundreds of thousands of people. They were just on vacation after all so what of all the people who actually lived in the areas that were destroyed? Weren’t their stories infinitely worse and don’t their stories also deserve to be told? I never felt that choosing to concentrate on one family’s plight pulled focus away from the grander disaster. In fact, I felt that the filmmakers often tried to show that they were not alone in their horror and that the local inhabitants were actually incredibly generous in their efforts to assist those who needed it. The fact remains that this was not the story of the tsunami; this was the story of this family and their story deserved to be told as much as any other. And now? Well, now, I don’t disagree with that statement in the least. Watts went on to earn a Best Actress Oscar nomination for her gruelling portrayal and McGregor received some of the best praise he ever has. I do want to single out one other standout performance though that I think would have gotten much more notice during awards season if it weren’t such a busy season to begin with. Tom Holland, who was 13 years old when he was cast in the film, has to carry a great deal of the story once Watt’s character becomes immobile. He emotes so much controlled fear while he’s trying to remain strong for his mother and completely disappears into the intensity of his circumstances. I predict big things for this promising, young man. 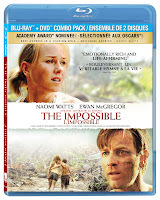 SPECIAL FEATURES: There are a couple of very brief but reasonably revealing featurettes included on THE IMPOSSIBLE Blu-ray. The first discusses casting the film, or the family in the film anyway. This amounts to not much more than actors patting each other on the back for being amazing when it could have addressed the decision to cast white, English actors when the original family this film is based upon is in fact Spanish. The second gives a very precise look at how the tsunami itself was recreated for the film when the budget did not allow for an all CGI experience. There are also some deleted scenes but the best feature of all is certainly the director commentary track. Bayona is very proud of this film, and rightfully so, and he shares that pride with the film’s writer and producer as well. Also included in the commentary is Maria Belon, the woman whom Watts portrays in the film and who underwent this awful ordeal to begin with. I truly hope that THE IMPOSSIBLE finds a wider audience in people’s homes. It is a truly great portrait of a truly brave family. How many sheep would you give The Impossible?